Imminent Disaster in Washington, D.C. If you’ve paid any attention to the news lately, you are aware that a major crisis looms for our nation. Indeed, I witnessed the crisis in person when visiting Washington, D.C. recently. In addition to the proliferation of BBQ sub sandwiches in and around our nation’s capital, our federal government faces an imminent disaster of its own creation. Yes, I am referring to the faux ‘cue that has made its way into the very heart of our nation’s capital. A trip to the Atrium Cafe* at the Smithsonian National Museum of Natural History revealed a menu with a few barbecue choices, including “Carolina style pulled pork.” At a steep $12.95 for a plate with two sides, I nearly skipped this meal but my thirst for knowledge hunger for pork prevailed. While the museum’s large collection of prehistoric fossils and other remnants of America’s natural history may be authentic, the Carolina style barbecue is not. Indeed, if I curated a barbecue museum I wouldn’t let the soggy, slow cooker-style swine pictured at left into my building, let alone feature it in my cafeteria. From the taste (no smoke and a half-hearted imitation of NC sauce) to the texture (pulled rather than chopped, as well as soggy), the Atrium Cafe’s barbecue is not fit for inclusion in a hallowed Smithsonian institution. I dare say that pigs are a more relevant part of America’s natural history than dinosaur bones and other dusty old relics. I wish our nation’s leaders would take action to force the Museum of Natural History to address the current cafeteria situation before it becomes a crisis. I am setting an August 2nd deadline for Congress to take action. If not, I will refuse to eat pork at a federal museum until true Carolina barbecue is served. 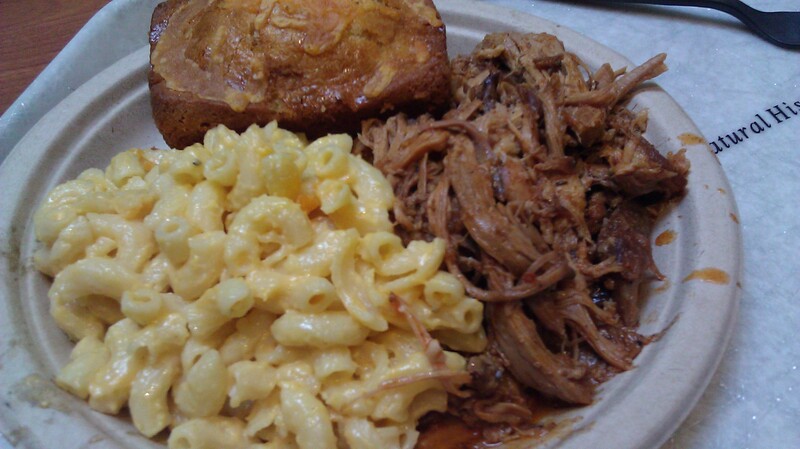 Better yet, each federally funded cafeteria should serve both Eastern- and Lexington-style barbecue. This would be a true “balanced solution” to the present problem. Please contact your elected officials and urge them to take action. *Editor’s note: We have heard reports that the Atrium Cafe will soon be renamed the Debt Ceiling and will have its hours cut dramatically. Aw, they are only being accurate. In DC in the 50’s we ate BBQ pork at People’s Drugstore, not so much slow cooker style as sitting all day getting thicker in the pot style, just as you described. By the end of the day the stuff was caramelized and wonderful. You’ve made me homesick!